As precious metals prices look to recover this summer from the damage done in the spring, the groundwork may be laid for a new multi-year cyclical leg higher. Investors can use this period to position themselves to get the most bang for their depreciating buck without assuming undue risk. n an up-move for the metals as a group, silver can be expected to outperform gold. Silver, owned in physical form, can deliver outsized returns with less risk than precious metals mining stocks or any of the various derivative and leveraged methods of ownership. 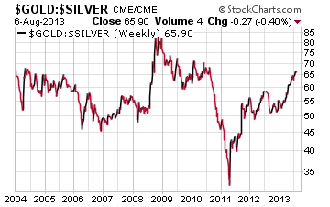 Why favor silver over gold? Let's look at the recent history of the gold:silver ratio. Gold traded as high as 85 times the prices of silver in late 2008. From there, silver staged a massive rally, outperforming gold, and narrowing the gold:silver ratio to 32:1 by late April 2011. At that time, we advocated sheltering wealth in gold instead of silver on an intermediate-term basis. We even suggested that for those inclined to trade, they had an opportunity to swap out of silver and into gold – with the aim of being able to switch the gold back into silver when silver got relatively cheaper versus gold. Silver proceeded to do just that, causing the gold:silver ratio to rise. As it turned out, the ratio rose higher and for longer than we expected. In recent weeks, gold has traded as high as 66 times the price of silver – a doubling from the 2011 lows. 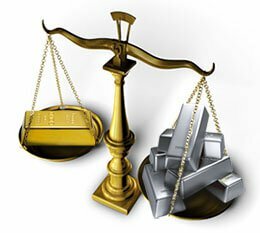 In our judgment, silver now represents the better buy of the two metals – both on an intermediate-term and long-term basis. That's not to say that you shouldn't own any gold. The metal of kings has practical portability advantages as a more concentrated form of wealth than silver. And a freak event could potentially take gold back up to the 85:1 ratio reached during the financial panic of late 2008. But realistically, the freak event in the precious metals probably occurred this past spring. The bottom line is this: Now could be the last great opportunity you'll have to reallocate your precious metals holdings more heavily toward silver before the white metal begins to gain ground on gold. When it does, it could do so explosively. The mathematical reality is that based on historical precedent, there exists a lot more potential in percentage terms for silver to outperform gold than for gold to outperform silver. We've made the case that silver will return to the classic ratio of 1/16th the price of gold (perhaps even to 1/10th) before the major bull market is over. This is the ratio at which silver was priced to gold in various societies going back centuries. It's also the ratio that was hit at the last major bull market peak in January 1980. At 1/64 the price of gold currently, silver would have to increase in value 4 times relative to gold in order to get there. While gold would almost certainly rise during the same period, silver could outperform gold by 300% or more. Last year, when platinum was selling at a rare discount to gold, we alerted readers to the opportunity to buy platinum at compelling relative value. It now trades at just a small premium to gold. While we expect this premium to expand, the case for favoring platinum versus gold is somewhat less compelling than it was. We also suggested its sister metal palladium. It has since outperformed all the other precious metals and shows a modest gain for 2013. As with platinum, the case for favoring palladium – at least versus gold – still exists, but it's somewhat less compelling than it was. However, the case for silver, after having been beaten down mercilessly in the futures markets in the first half of 2013, is now even more compelling than the cases for platinum and palladium. Silver offers the most upside potential of any of the precious metals.